Welcome to the land of Hi-Tech ‘budget’ air purifiers! True, these words don’t often come up in the same sentence, but the Winix WAC9500 Ultimate Pet Air Purifier brings the functionality of a thousand dollar system down into the low-med budget range. 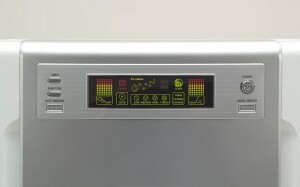 Packed with automated functions and plenty of sensors, you can simply “set-and-forget” this bad boy for maximum energy and air purification efficiency. 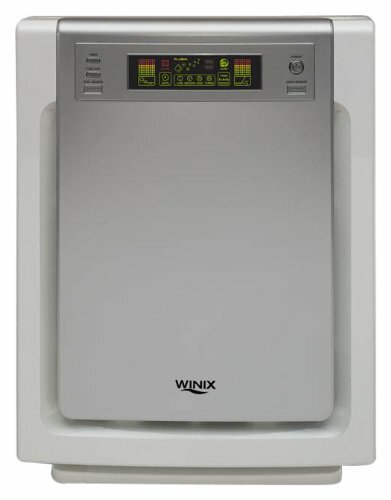 If using auto, if the pollutant levels in the room rise, this Winix air purifier ramps up the fan speed accordingly and clears the room until it reaches normal levels again. 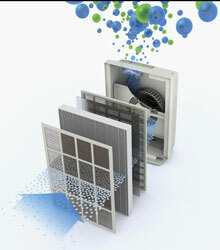 Air passes through a 5-stage filtration process with each stage removing specific pollutants. Starting with the washable anti-microbial pre-filter, which captures larger pollutants such as pet hair and utilizes anti-microbial technology to eliminate odors on the spot. WAC9500 Ultimate Pet with PlasmaWave. 4) Odor Control Carbon Filter. 5) Nano Silver Anti-Microbial Treatment. 16.5 x 8.9 x 21.9 inches (L x W x H). Remote Control, 4 Fan Speeds, Sleep Mode, ‘Energy Star’ Efficiency Label. Next is the True-HEPA filter which captures particles as small as 0.3 microns. To put that in perpective, the HEPA filter will remove dust, dust-mites, pollens, mold spores and even smoke particles from the air. These HEPA filters are extremely effective and are considered the ‘gold standard’ when it comes to filtration systems. The air then receives a nano-silver anti-microbial and Winix’s own PlasmaWave TM treatment which destroys any remaining germs, odors and even chemicals. The final filtration before being released back into the room is an Advanced Odor Control carbon filter. This is a washable filter made from coconut shell, and is up to 3 times more effective at absorbing and neutralizing odors compared to ordinary disposable carbon filters. The Winix WAC9500 Ultimate Pet has been specifically designed with pet owners in mind. Super effective at removing allergens and pet dander from the air, along with targeting odor elimination. A quiet fan means that you will forget that you have it running 24/7, and Energy Star rating means that you won’t notice it in your power bills.